Jakarta DPRD Commission D assessed, Jakarta Environment Dept. 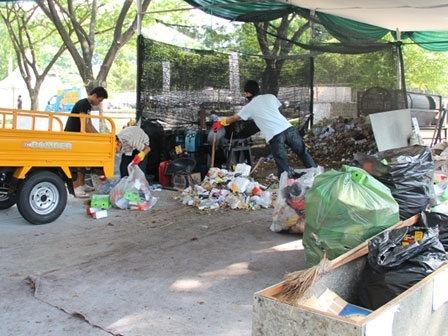 in waste management has been an example for other cities in Indonesia.
" In this matter, we appreciate for the success of 3 R center development"
Especially, waste management program development center 3 R (Reduce, Reuse and Recycle) that has been running in the capital. "In this matter, we appreciate for the success of 3 R center development," expressed Iman Satria, Chairman of Jakarta DPRD Commission B, Wednesday (10/4). He also encourages the dept. keeps continuing to develop and expand the scope of the 3 R center program. Waste management will be better if it is done starting from home. "It should be done early by sorting organic and non-organic waste, wet waste and dry waste. Thus further management can be more easily and regularly," he said. He also supports the planned Intermediated Treatment Facility (ITF) development in Jakarta that will start in Sunter, North Jakarta. Its presence is trusted to reduce the volume load of waste in the Bantar Gebang Landfill.